Thanks to Dr. Jamie Shutter, South Beach Medical Consultants LLC, for contributing this case. To contribute a Case of the Week, follow the guidelines on our Case of the Week page. Introducing Epitomics' IVD Sampling Program. For a limited time, the following antibodies for anatomic pathology are eligible for this special offer. Take our short questionnaire and we'll send you the antibody of your choice free. Eligible antibodies include: c-Myc, Cyclin D1, PMS2, MSH6, ERG, and others. EP Clones™ are a line of high quality antibodies for anatomical pathology. 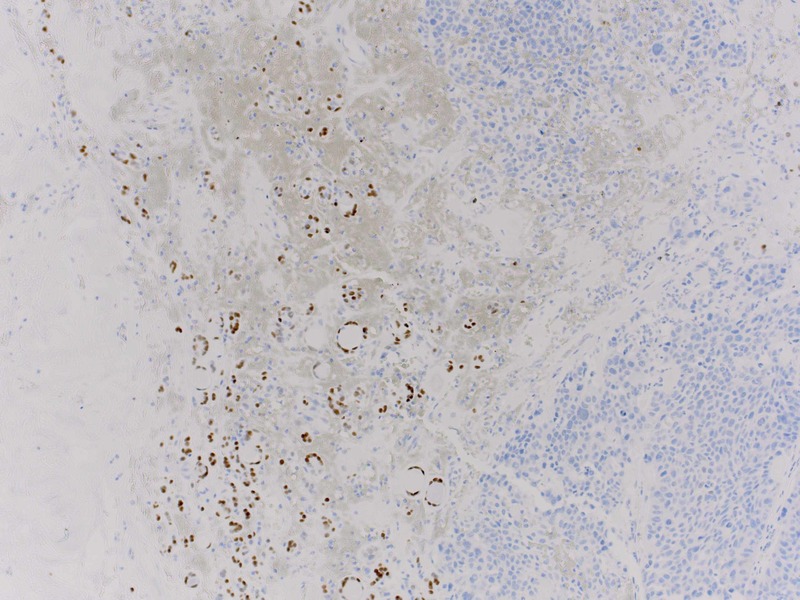 Each antibody was generated using Epitomics' patented Rabbit Monoclonal Antibody (RabMAb®) technology offering superior binding affinity and specificity. We now have over 150 antibodies, fully validated, ideal for FFPE tissues. (1) Our Feature Page for the month highlights Books and Journals, and includes Laboratory Investigation, Lippincott, Williams & Wilkins and Modern Pathology. Also check out our new monthly Mystery Image, on the right side of the Home Page. • Prostate gland and seminal vesicles: by Ali Amin, M.D., Komal Arora, M.D., Gladell Paner, M.D. and Monika Roychowdhury, M.D. • Kidney Tumor (adult malignant): by Sean Williamson, M.D. • Liver and intrahepatic bile ducts-nontumor: by Komal Arora, M.D. • Ovary-nontumor: by Mohiedean Ghofrani, M.D. and Shahidul Islam, M.D. (3) New Management Page articles include: Medicare Changes Enrollment Guidelines From 30 days to 60 days, by Leigh Polk, PSA, LLC, click here and ACO's, Practice Buy-outs and D�j� vu All over Again, by Mick Raich, Vachette Pathology, click here. 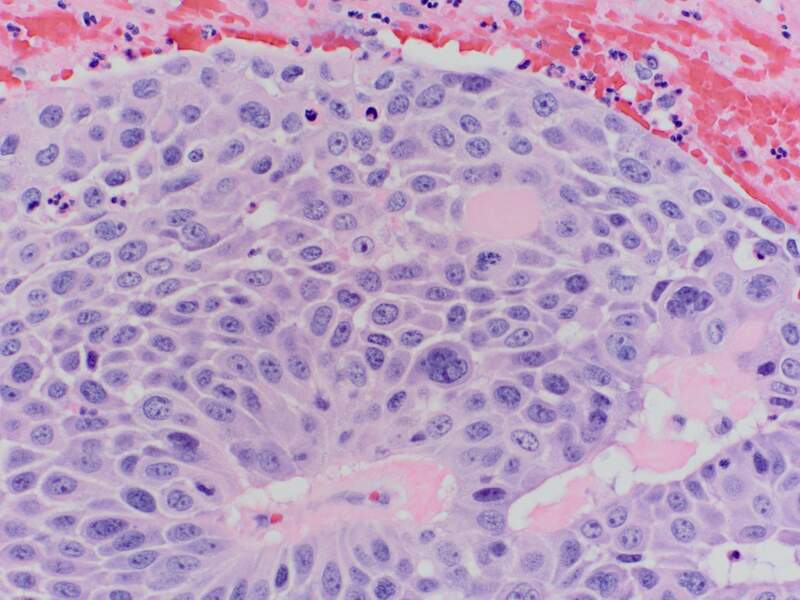 The squamous cell carcinoma measured 5.5 mm. Tumor cells were strongly positive for CK5/6 and p63, and negative for TTF1 and thyroglobulin. Squamous cell carcinoma of the thyroid gland is very rare, with less than 100 cases reported. It typically affects older patients with chronic goiter, who usually present with a rapidly enlarging neck mass. The tumor cells may derive from squamous cells of the thyroglossal duct or branchial pouch remnants, or from squamous metaplasia in Hashimoto�s thyroiditis or papillary carcinoma. 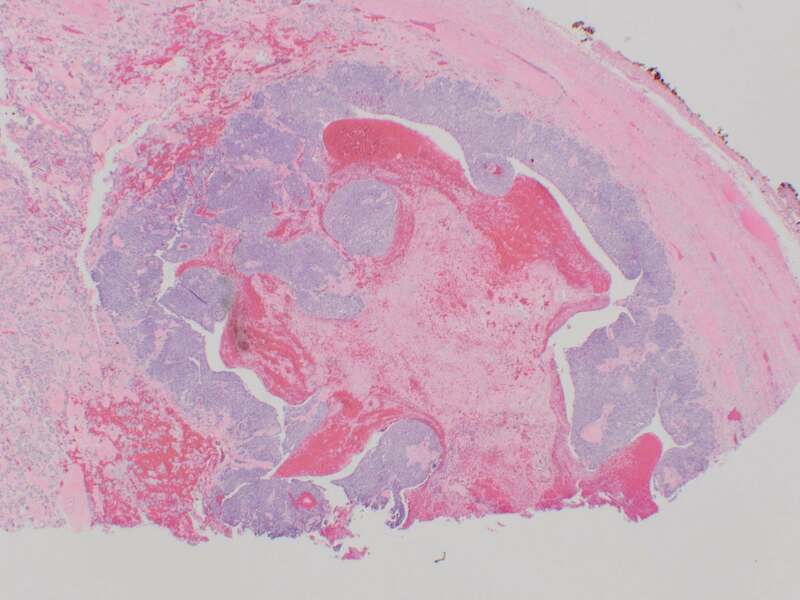 Squamous cell carcinoma may be part of an anaplastic carcinoma, or be associated with classic or tall cell variants of papillary thyroid carcinoma (Mod Pathol 2000;13:742). The differential diagnosis includes extension from a laryngeal or tracheal primary or metastatic disease, which are more common and may have a better prognosis (J Laryngol Otol 2011;125:3). 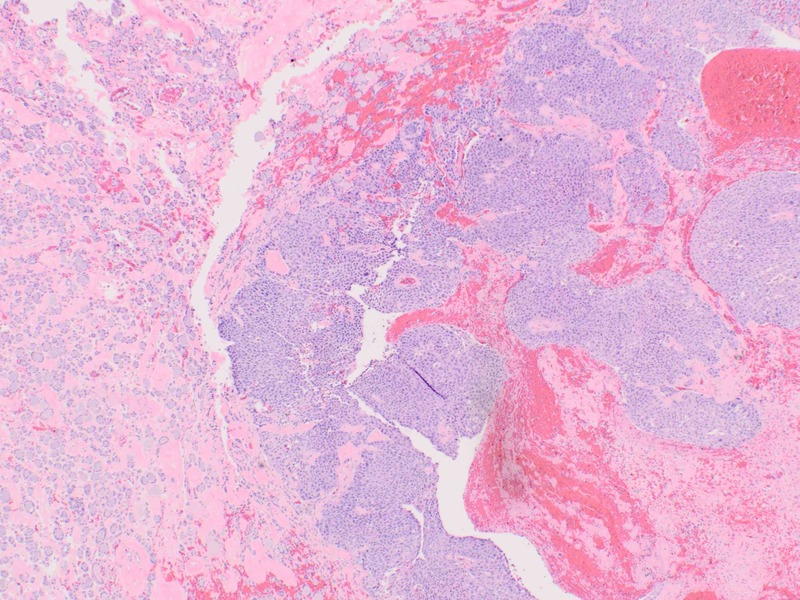 In the thyroid gland, metastases usually present as multiple nodules. 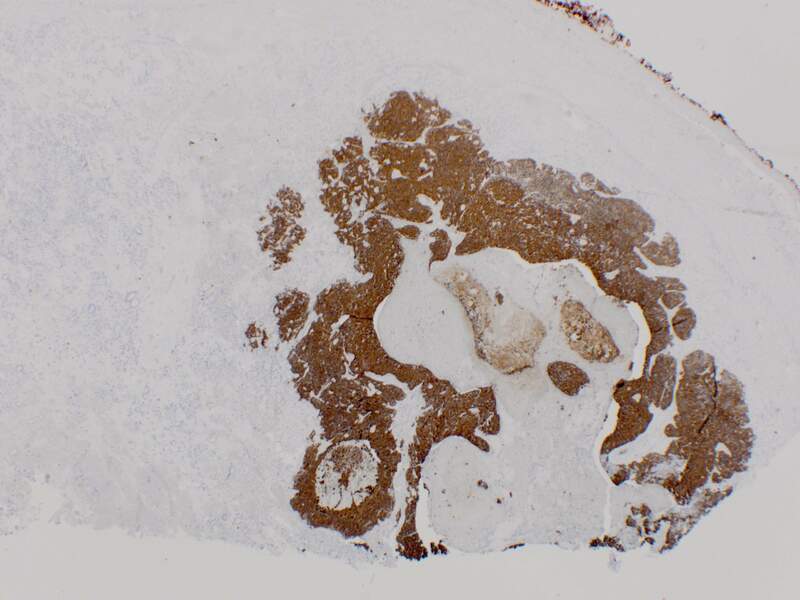 This patient actually had prior squamous cell carcinoma in the scalp, resected approximately 20 years previously. 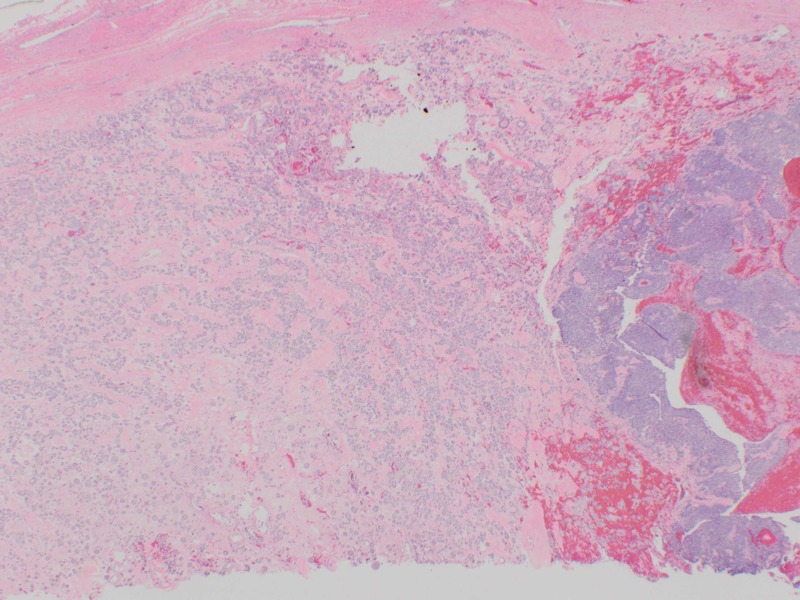 Squamous cell carcinoma has a poor prognosis, due to extrathyroidal extension. Death occurs in almost all cases, with a median survival of less than 6 months (Int Semin Surg Oncol 2007;4:8, Endocr J 2008;55:359). Preoperative chemotherapy and surgery may prolong survival (Head Neck 2012;34:131).